1. How did you get started as a writer? I remember writing stories from a very young age. When I was in the 2nd grade, my mother hole-punched several pages of stories and used yarn to tie together a front and back cover. On the front she wrote, “Karyn’s Book of Stories.” From that moment, I considered myself a published author! I also remember writing a newspaper full of stories. I sandwiched carbon paper between the pages and used a typewriter. It took a long time but I was persistent and made copies for each member of my family. 2. What is your book, “JUBILEE!” about and what gave you the idea to write it? I never started out to write a children’s book. The idea came from my interest in jubilees, a unique phenomenon that occurs primarily on the Eastern Shore of Mobile Bay in Alabama. When the weather conditions are just right, all kinds of sea life migrate to the shoreline and can simply be picked up by hand, scooped with a net, or gigged. I read about jubilees in a newspaper article and started doing research and asking locals about their experience with jubilees. The stories were so wonderful that the idea gradually came to write about jubilees in a storybook form. That question is very difficult to answer. I first read the article about jubilees in August 2005 and the book was published in 2012! Doing the research, writing, and revising were a hobby for me and I played with it in my spare time. I will tell you that it took a year for one publisher to finally send me a rejection letter. As you can see, writers have to accept delayed gratification! 4. How was the illustrator for “JUBILEE!” chosen? 5. Is “JUBILEE!” your first published book? It is my first children’s storybook but I have published four other books on different topics written for teachers. 6. What was your favorite book as a child? It is hard to choose just one but I did have a fascination for The Little Rabbit Who Wanted Red Wings. The moral of the story is to just be you. I still work to live by that motto. 7. What advice do you have for writers? Lots! First and foremost, writing is NOT about grammar, spelling, punctuation, penmanship, or parts of speech. Writing IS taking an idea, reworking it your satisfaction and making a record of it to either share with others or reread it yourself at a later time. Also, writing isn’t just the act of putting words on paper. The ideas must first be formulated in your mind before they can be written down. This is why I do much of my “writing” during my daily 3 mile run. Write on topics that you love and are interesting to you. Mostly, write the book that you would want to read. Just like Caroline in the story JUBILEE!, I had a fascination with cameras and taking photos. There was a section cut from the book (due to space limitations) in which Caroline pretended to snap photos of people fishing along the Causeway as she and her mother drove out of the tunnel. In the 1960's, cameras used only film which had to be developed at a photography shop or drugstore. (Unlike digital cameras today, you had no idea how your picture would look until the roll of film was used and the photos were sent back from the developers which usually took over a week.) There was a good bit of expense involved in buying and developing pictures, so we often looked through the viewfinder and pretended to take photos just like Caroline. Here is a photograph of my friend Peggy Todd (on left) and me (on right) as we sat in my front yard holding a large sign that read, "SMILE" and we pretended to take photos. 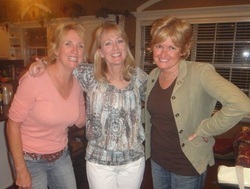 Here we are again in 2011 with Peggy (left), me (middle), and friend Karen Busby Thompson (right) at our high school reunion in Tulsa, OK. We still love to take pictures!